The Victoria and Albert Museum (V&A) announces REVEAL, a free, week-long public festival running from 30 June to 7 July 2017. Art and design commissions, performances, fashion, family activities and collaborations with neighbouring Albertopolis institutions will celebrate the opening of the V&A’s Exhibition Road Quarter designed by the Stirling Prize-winning British architect Amanda Levete and her practice AL_A. Opening on 30 June 2017 as the Museum celebrates its 165th anniversary, the V&A Exhibition Road Quarter is the Museum’s largest architectural intervention in the last 100 years. 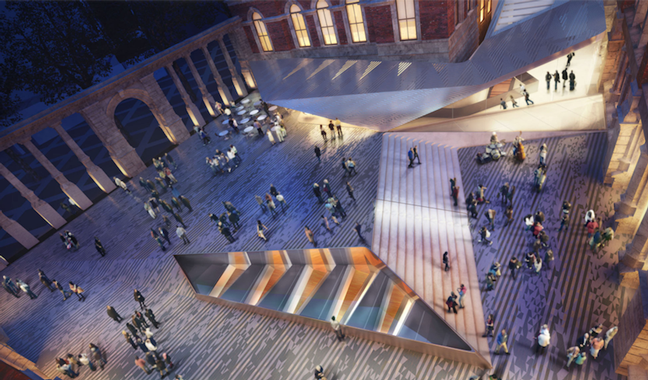 This innovative and ambitious project will create beautiful new public areas and gallery spaces for London, transforming the experience of the V&A for visitors, and revealing historic facades of the V&A’s existing Grade I buildings for the first time. To celebrate these new spaces, the V&A will stage a festival themed around the word REVEAL, inviting the public to explore the V&A Exhibition Road Quarter’s unique combination of heritage, modernity and technology with a series of events that bring the architecture and collections to life. Visitors will be able to enter the V&A Exhibition Road Quarter through the arches of the renovated 1909 Aston Webb screen, opening up the Museum to its neighbours on Exhibition Road. The new spaces include: The Sainsbury Gallery is a versatile, 1,100m sq column-free exhibition space purpose-built for the V&A’s world-leading programme of temporary exhibitions; The Sackler Courtyard is the world’s first all-porcelain public courtyard, inspired by the rich tradition of ceramics at the V&A; The Blavatnik Hall is a new entrance into the V&A that will transform how visitors experience and discover the Museum and collections. The festival will open with a special music and digitally-themed Friday Late on 30 June, hosted in collaboration with Boiler Room, which will bring audiences to the V&A and beam the Museum out to the world. It culminates on Friday 7 July with Fashion in Motion, four special catwalk shows in the new Sainsbury Gallery featuring Molly Goddard, British Emerging Talent winner at the 2016 Fashion Awards. In the spirit of Albertopolis, the Victorian vision for a city of arts and sciences in South Kensington, the V&A is also collaborating on a range of events and activities supporting the REVEAL theme throughout the Museum with partners from across Exhibition Road, including: Discover South Kensington, Imperial College London, Natural History Museum, Royal Albert Hall, Royal College of Music, and the Science Museum.